Legend says that if you see Mt. 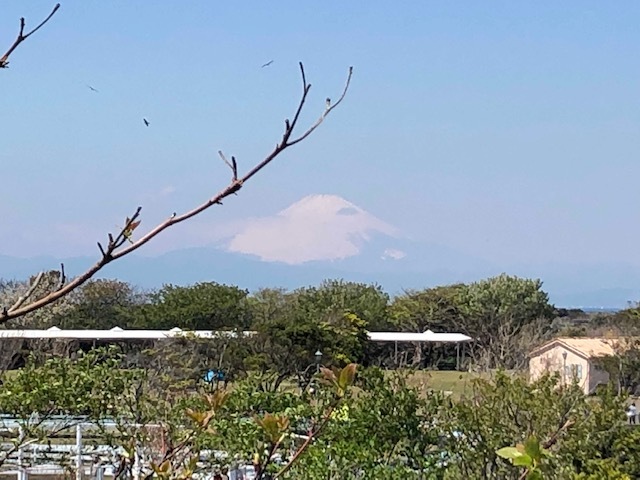 Fuji you will return to Japan. We had amazing, crisp views all morning while we were at Soleil Hill Park, but by the time we left in the early afternoon the view had disappeared behind the clouds. We have only one month left to go in Japan! When I wrote the date in the title, I realized that in less than 30 days we will be packing our bags once again, and hauling them out to the airport for our flight back to the U.S. on May 14. That’s as much as I’m going to think about leaving for now though because I know it’s going to be very emotional for us parting from our family here, and leaving a place we love so much. Brett took K for a spin in a go-kart at Soleil Hill park. This past week was mostly a nice, relaxing one for us: picking up our grandson every day from school, running our regular errands, enjoying the Todoroki Ravine Park, and going out to dinner with our son and family. Yesterday we headed down to Yokosuka to spend some time at the wonderful Soleil Hill family park with our son and family, and then do one last shop at commissary. 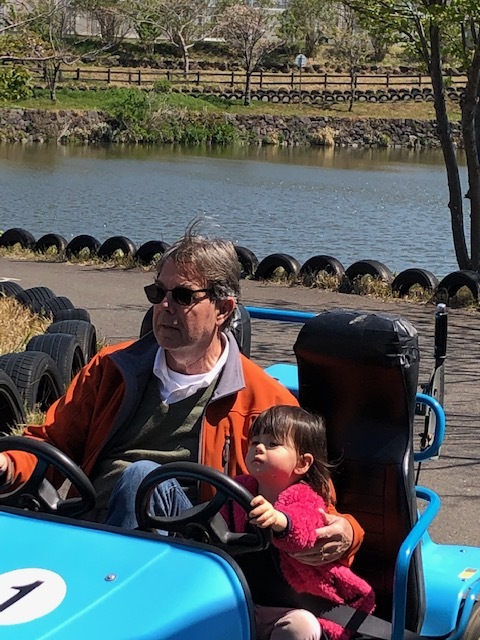 The park, located in an agricultural area near Yokosuka, had all sorts of fun and interesting activities for the whole family, including go-karts, swan boats, several amazing playgrounds, an amusement park, and a petting zoo (we got to pet a capybara and some kangaroos!). The park was also decked out for spring with beautiful flower beds throughout the park. Getting on base though was easier said than done because it took us nearly two hours to get our son a pass to bring the car on base! Nothing was wrong other than there was a long, long line at the pass gate for some reason. It was dark when we finally left the commissary to come home, but the trip back was easy with no traffic, and we are set with food and supplies. We received a surprise windfall this past week – a check for $1250 from Wells Fargo Mortgage. We sold our house five years ago, but apparently Wells Fargo had never given us back the mortgage insurance we had overpaid by several months (we thought we had received it in the settlement). In the load of forwarded mail from Brett’s sister was a check for the overpayment plus the interest earned on the amount over the past five years. The money more than covered our income tax payment this year, and the rest went into savings. Reading: I finished Educated (couldn’t put it down), and am now reading We Were the Lucky Ones by Georgia Hunter, a novel about an extended Jewish family in Poland that somehow managed to survive the Holocaust. It is based on the actual story of the author’s family. I’m still waiting for my books to come off of hold at the library. Listening to: Our little washing machine is going with a small load, but otherwise all is quiet here this morning. Watching: I didn’t watch anything this week – I was too busy reading! Cooking: We’re going out for lunch today with a former student of mine, and having tacos tonight, to finish up some leftover taco filling. We were going to have them last night, but we got home too late from Yokosuka and ended up eating other leftovers. Happy I accomplished this past week: I finally found a birthday present for Brett (his birthday is next weekend). The gift had to be something he would enjoy that would also fit into his suitcase, so it was a bit of a challenge. Brett filed our taxes yesterday evening – we waited until almost the deadline because we have to pay a small amount this year. Looking forward to next week: Brett and I are going to Shinjuku this week to visit Bingo-ya, a store that showcases Japanese folk crafts of all sorts, from pottery to dishes to fabric and more, and also to go out to lunch. We’re going to go back to the Sogo department store as well later in the week, although to one that’s closer to our house than Yokohama. We’re hoping they carry the items we want so we don’t have to make the longer trip. Look who stopped by Grandma’s and Grandpa’s house for a while last Wednesday! Thinking of good things that happened: Our visit to the Todoroki Ravine Park on Tuesday was one of the nicest outings I’ve ever enjoyed in Japan. It was a beautiful spot, and the weather was perfect. Brett’s enjoying and doing well in his calligraphy class, and we got him the necessary tools and paper at Tokyu Hands so he can practice at home between classes. On Wednesday evening we went out to dinner at a wonderful noodle restaurant down the street from our house with our son and family (we ate there last week with Meiling and K before they left). I enjoyed what I think is my favorite meal in Japan: katsudon, a breaded pork cutlet cooked in a soy broth with onions and egg, and then served over a bowl of rice. The meal came with a small bowl of handmade udon noodles, tofu, and some tasty pickled vegetables. Our DIL ordered the same meal and had this to say about the food: If this restaurant was near our house I would eat here every day. Thinking of frugal things we did: We did not spend a whole lot of money this week (well, until we went to the commissary yesterday), and have managed to get our daily spending average down to $48.61 for the month. We’ve also done a good job of eating up all the leftovers so there has been no food waste. I had been watching the J. Jill sales section for some warm pieces to take to (chilly) England this fall, and this past week ordered a sweater, sweatshirt and poncho at 40% off the sale price. The total for all three items was less than $100, including shipping, and like all J. Jill items they will last a long time. All my other clothing is hanging in there, although I will need to get new socks and shoes when we get back to the U.S. Some cherry trees were still in full bloom last week . . . 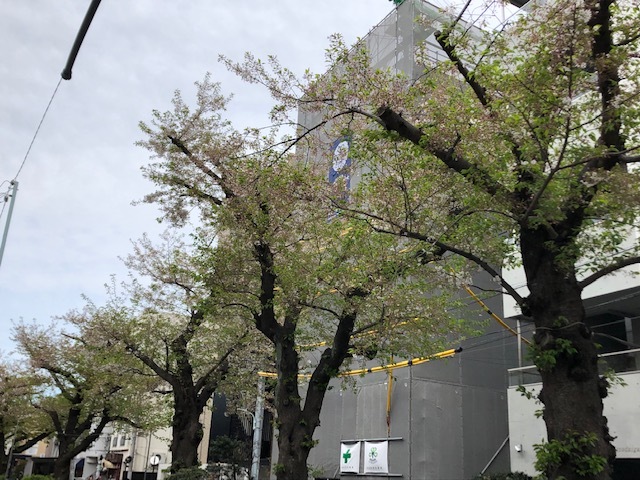 Grateful for: While we have greatly enjoyed the cherry blossoms this year, I am also thankful to see green leaves replacing the flowers – spring has arrived (although we had a couple of days of very cold temperatures this past week that made us wonder). 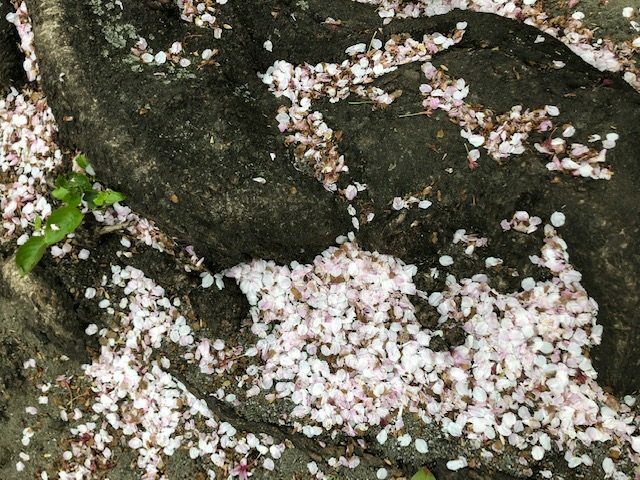 The sight of fallen blossoms on the ground is a reminder to fully enjoy and appreciate all that is good and beautiful in life because like all things it will eventually change or pass.
. . . but many have almost lost all their blossoms and are leafing out. Fallen blossoms are a reminder of the impermanence of all things in life, and to appreciate and enjoy the good things while we have them. Japanese word of the week: mingei 民芸, meaning folk arts or art of the people. There is a great appreciation in Japan for the beauty of everyday objects and the arts and crafts of average people, things that are practical and can be used in daily life. Mingei are not “one of a kind” pieces of art but items produced in quantities by hand. They should be inexpensive, simple, practical in design, and are meant to be used and represent the region of Japan they comes from. There is a Museum of Japanese Folkcraft nearby us that I hope to visit before we leave. By the way, the kanji 芸 in mingei is the same as in geisha 芸者, which means person who does art. We’ve got our fingers crossed that this week will be another relaxing one. We’ve made a casual list of things we want to get before we leave, and places we want to see (like the Museum of Folkcraft and the National Museum of Japan in Ueno Park), but we don’t want to feel rushed. Our time here has been wonderful, and we want it to stay that way right up until we leave. 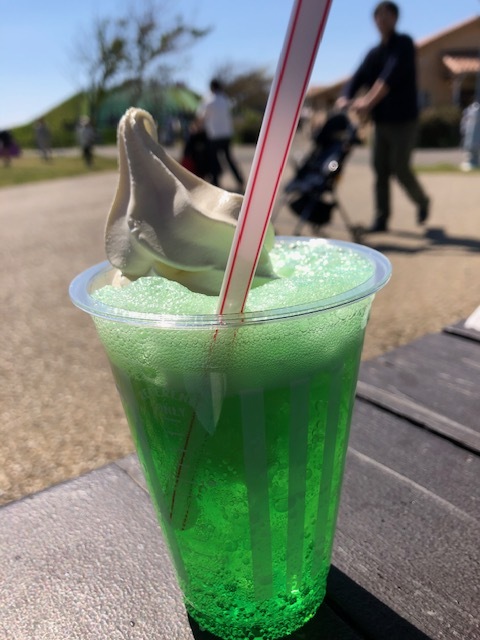 A melon soda float for spring – the soda really tastes just like melon, and the ice cream from Hokkaido was the richest I’ve ever tasted. I hope you all had a great week, and that spring has finally arrived wherever you are. Wonderful slideshow of the flowers. Can’t believe you’ve been in Japan for 8 weeks. Time is flying. The flowers in this park were absolutely gorgeous, and they smelled wonderful too! Everywhere you turned there seemed to be flowers, and in the center of the park was a huge circular mound covered with “baby blue eyes” (Nemophila), one of the most beautiful flower beds I have ever seen (of course my pictures didn’t turn out). Our time here is starting to fly by. There’s lots we still want to see and do though, which of course is going to make it go even faster. Loved Educated and also could not put it down. And it is wonderful to see spring flowers – you are surrounded by gorgeous scenery. Your time in Japan has flown by – at least to me. Ha! But so many great adventures and family times. We spent the weekend in Chicago where I got to see two of my three adult kids. The weather was sunny but cool. Everyone is out and about in the sun – high on the hope of spring. Today we’re back home with a snow/ice mix. Honestly, I’m just over it. My daffodils are about six inches out of the ground, but they’re hardy. I just hope none of my tender bushes & trees get frost bitten once they start blooming this year. We are predicted to go to the 60’s again by Tuesday, so here’s hoping. I’m about to feed 12 people Easter brunch, and the whole event is easier and brighter in good weather. We had lunch with a friend yesterday and she said what you did about the weather (“I am just over it this year.”) Thankfully though we are seeing more sunny days now, and temperatures are beginning to warm up. Actually, Brett forgot the keys to our son’s home today because they were in his jacket pocket and today was the first day he didn’t need a jacket! We have seen several places recently with spectacular spring floral displays. Added to the cherry blossoms it’s been a feast for the senses. We really have been having the best time here. I’m so glad we decided to stay as long as we have this time, and wish we could stay longer. But, we’ll be back! We’ll be doing Easter and Brett’s birthday with our son and family, and then we’re heading out on another outing the weekend after that – the beginning of Golden Week! Wow! 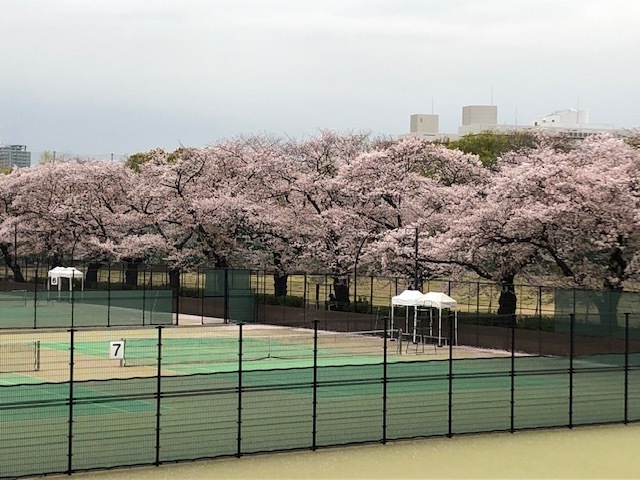 3 months in Japan – good for you. We will be there in Kyoto for the month of May to visit our granddaughter who just turned 3 and started kindergarten in April. We try and get back 2x a year while we can. Getting more expensive due to higher lodging costs – son’s apartment is not big enough for us to stay with them. I guess Kyoto Airbnb rules are causing increased costs. Lucky we can afford it if we are careful. We will be exploring other lodging choices while there. BTW I think your choice of California for retirement living is a good choice. 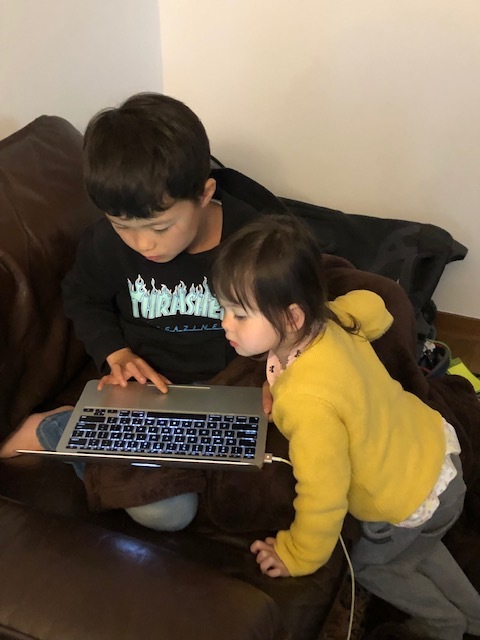 We thought about moving to Japan for a few years to help with granddaughter but decided trying to deal with any health issues and not speaking the language would prove to be a problem – we are both just over 70. It’s been wonderful being able to be here this long – such a different experience than our shorter stays in the past. We learned too that they have changed the rules about how much you can visit in a year – up to 90 days within a 180-day period, so you can now come twice in a calendar year. Lodging is expensive here, but we knew it would be and budgeted accordingly. The new Airbnb rules really changed things though, and took many former rentals off the market. We would give anything to be able to stay here longer, to help with child care, but there still is no visa for us that would let us stay long-term. I’ll have a post up tomorrow about the pros and cons though of staying here long-term – language is the #1 issue. We can get around, but miss so much else because we don’t know what’s being said, or what it says on signs, in magazines, etc. Unexpected money in the mail is the best. I, too, had a hard time putting Educated down. Tara Westover’s been interviewed a couple of times for local radio shows here in Idaho. I missed her talk when she was here unfortunately. That would have been interesting. It doesn’t seem like 8 weeks on this end. Really enjoying all your beautiful photos. The “slow” travel is so appealing. We’re off to the Cotswolds for a 56 mile trek. If you’re a walker, you’ll enjoy those public footpaths in the fall. That money was a HUGE surprise! A nice one, but still a surprise. We almost put the envelope with the check in the junk mail pile too because we hadn’t dealt with Wells Fargo for five years! I don’t think that except for special situations that we will ever go anywhere again where we don’t stay for at least a month. The longer stays make such a difference in how we experience a place, and what we get to see. We’re looking forward to our three months in England this fall, and are just now getting started on plotting out what we want to see, what side trips to take (London, Edinburgh, and Wales). I too enjoyed Educated – we read it for book club and had a very interesting discussion. I really, really want to try that melon float! They had a fun ride together. After the go-karts we tried the swan boats with the grandkids, but that didn’t go as well. Japan does melon things very well, and gets the flavor right. And that ice cream! I have NEVER had such thick, creamy ice cream in my life – it was almost like eating frozen butter (in a good way). As I was reading Educated, I found myself cheering her on out loud – Brett wondered what the heck I was reading because I’ve never done that before. You probably know all about this already but the Asakura Museum of Sculpture in Yanaka (and the whole Yanaka area) was one of my very favorite things to see/do when I spent 10 days in Tokyo. Yanaka was so cool to see since it survived WW II pretty much intact so is more “old Japan” than most of Tokyo. Also I will have to get the name for you for when you are in Portland but my brother and Japanese sister-in-law turned us on to an amazing little Japanese restaurant on 99 W near 217 when they were here a month ago and I had the BEST katsudon, very reasonably priced (like $8.50) for dinner. We have plans to go to Yanaka during Golden Week!! We are going to do the seven lucky gods temple pilgrimage which should get us through a lot of the neighborhood. We’re also going to visit the National Museum in Ueno Park that week. Apparently Golden Week is a great time to go sightseeing in Tokyo because the city empties out. There was a restaurant in the Woodstock neighborhood when we lived there that made very good katsudon (and for about $8.50) but we noticed when we were in the neighborhood in December that the restaurant had changed hands so don’t know if we could still get it there. 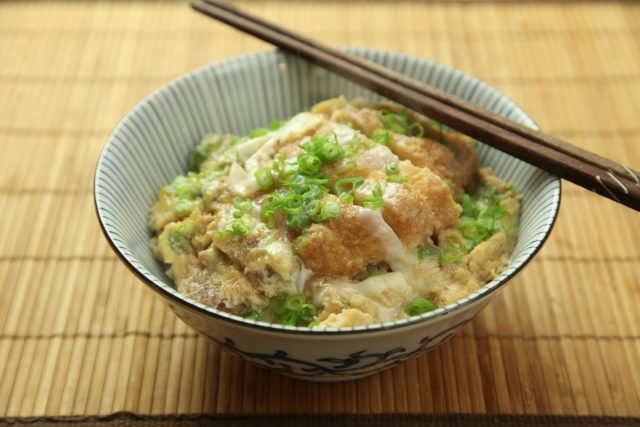 I make oyakudon (chicken and egg) but I’m going to have to get serious about learning to make my own katsudon.